Why Stick Fix...As the world leader in repairing composite hockey sticks, we are excited and confident in being the best composite repair process in the market since 2004. The hockey stick breakage has proven a need for our reliable repair process, and not just a bandage approach to fixing hockey sticks. As a result, Stick Fix recognized and perfected a repair process with a proven technology. 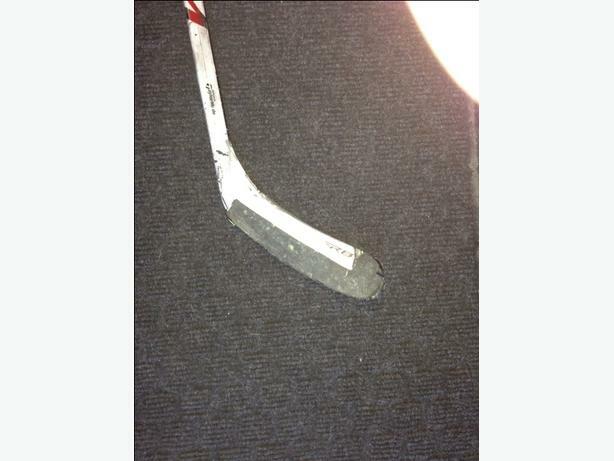 We are the Experts and we are Leaders in repairing hockey sticks. The length of shaft will remain the same, the curve of blade will remain the same. We also provide custom changes such as, curve and lie changes. Potential Net Profit...all we can say is, we are the best! By using our repair process, we have offered enormous savings to parents, players and teams. Not only that, but the ability to recycle your hockey sticks. Why You Should Consider Stick Fix as an exciting business opportunity. We will teach you not only how to fix composite hockey sticks, but also how to repair, hockey skates, lacrosse sticks, canoe paddles, ski poles, kayak shafts, windsurfing rudders, mast poles, floor hockey sticks, ringette sticks, field hockey sticks, baseball bats, high-end bicycles, etc. We will also teach you how to Sharpen skates if you are interested in building your business into a Pro Shop. We have now developed our own hockey stick called the "Sabre Pro", by understanding how and why hockey sticks break we have based our new Sabre Pro on the premises of performance, and durability. We can also provide our franchises the opportunity to sell the best skate blade on the market called "Flare Blade"
Stick Fix offers you the opportunity to own and operate your own dynamic repair business, centered on a proven hockey stick repair system. The Stick Fix Management team knows that ultimately its success depends on your success. We have a roll-up your sleeve mentality toward innovation, listening to franchisees, and listening to our customers. We are seeking enthusiastic individuals. If you feel you have the passion and drive to become a Stick Fix Franchisee, we'd like to hear from you.